Animal Wildlife | Opossum | The opossum is a medium-sized animal that is found inhabiting farmland and forested areas of North America. 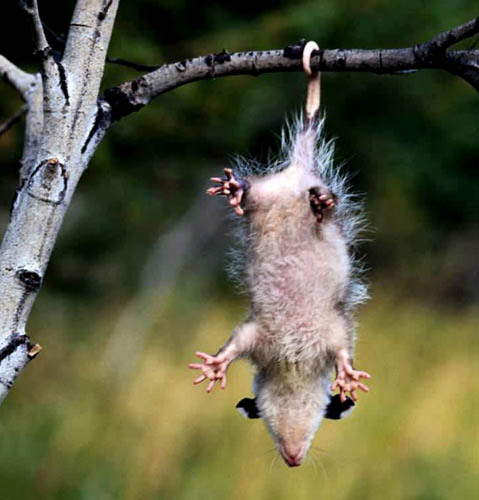 The opossum is thought to have evolved from the basic marsupials that lived in the jungles of South America. The opossum is often referred to as a opossum, although there is no direct link between the possums of Australia and the opossum of America. The opossum is the only species of marsupial that is found outside of Australia an it's surrounding islands. The opossum is found inhabiting areas of grassland, farmland and woodland in North America. The opossum is also found in urban areas where the opossum can be a pest as it feeds on rubbish, and food that it finds lying around. The opossum is generally found in areas that are close to water. The opossum is known to be one of the world's animals that carries rabies and the opossum is much more likely to have the disease than any other animal. Opossums are also thought to have some immunity towards the venom of certain snakes such as pit vipers and rattlesnakes. The opossum is an omnivorous animal and will eat almost anything that it can find. Opossums mainly feed on insects, frogs, birds, snakes, small mammals, and earthworms. The opossum is also a great scavenger and will feed on left over kills of other animals along with road-kill. 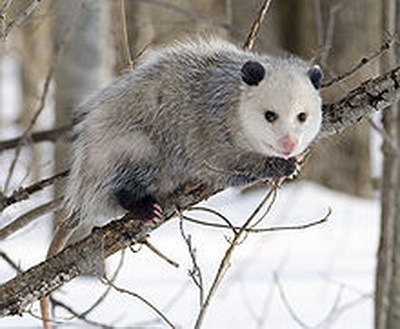 The opossum has a number of natural predators in it's environment although the main predators of the opossum are birds of prey such as owls and eagles, dogs, foxes and cats. Humans are one of the main predators of the opossum as they hunt them for meat but the opossum is also commonly killed on the roads by cars. Nice article! 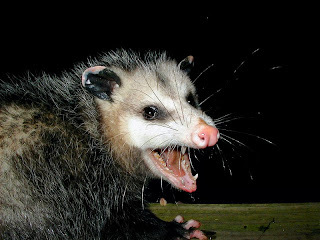 One question: when I visited another site about this animal, www.opossum.org, it said exactly the opposite regarding rabies: "Rabies and viral diseases (e.g., distemper) are practically unheard of in the opossum." Is this just pro-opossum propaganda?